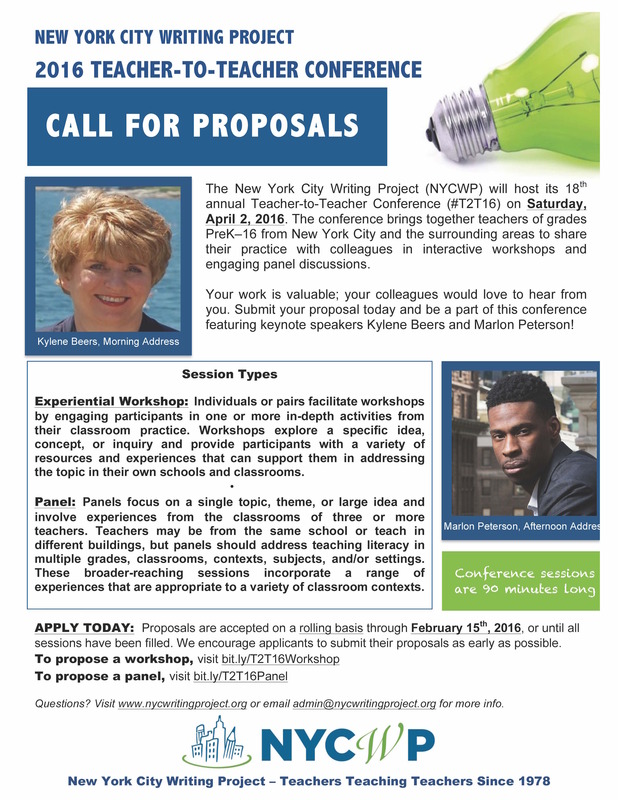 Apply today to facilitate a workshop or a panel at the New York City Writing Project’s 18th annual Teacher to Teacher Conference (#T2T16) on Saturday April 2, 2016. The conference brings together teachers of all grades and content area from NYC and the surrounding areas to share their practice with colleagues in 90-minute interactive sessions. Facilitators of interactive workshops prepare one or more in-depth activities from their classroom practice and engage participants in those activities and a conversation about practice, craft, and application of those activities. Workshops explore a specific idea, concept, or point of inquiry, and provide participants with a variety of resources, articles, and experiences that can support them in addressing that topic or concept in their own schools and classrooms. Workshops are facilitated by an individual or pair. If you propose a panel discussion, your panel will focus on a single topic, theme or large idea, but feature experiences from the classrooms of three or more teachers. Teachers may be from the same school or teach in different buildings; these sessions can be appropriate for one or many disciplines or age levels. Panels should address teaching literacy in a variety of contexts, be they grades, classrooms, subjects, content areas, settings, with different populations, etc. These are broader-reaching sessions that incorporate a range of experiences that will be appropriate to a variety of teachers and contexts. Like workshops, panels should address application and theory in as interactive of a format as possible. This year’s Teacher to Teacher Conference will feature two keynote addresses. Kylene Beers will deliver the morning keynote. She is an award-winning former middle school teacher who has turned her commitment to adolescent literacy into the major focus of her research, writing, speaking, and teaching. Marlon Peterson will provide the afternoon address. He is a national social and criminal justice advocate, writer, organizational trainer, community organizer, and educator who spent 10 years in New York State prisons and was profiled on Humans of New York. Tickets for the conference will go on sale in February. Proposals of workshops and panels will be accepted on a ROLLING BASIS FROM DECEMBER 15th, 2015 THROUGH FEBRUARY 15th, 2016, or until all sessions have been filled. If you are interested in presenting, submit your workshop proposal or panel proposal as soon as possible. ← previous Volunteer as a Juror: Scholastic Art & Writing Awards!